Metallic colors. Chrome accents. Retractable mechanism. Medium point black refill. REGAL colors for noble copy will catch the attention of all the kingdom. Gold Accents. Head em up, move em out - Raw Hide. Crackle leather-look grip in black, brown or blue will round up your customers and bring em in..Cracked Leather-look Grip. Gold foil bands and trim. Plastic body with metal clip. Retractable mechanism. Jumbo plastic medium point black refill. Individually polybagged. Gold foil bands and trim. Plastic body with metal clip. Retractable mechanism. Jumbo plastic medium point black refill. The Stratford Pen is scholastic enough to complete any orientation packet. The Stratford has a time-honored executive design with a gloss finish barrel that is offered in 8 classic colors. 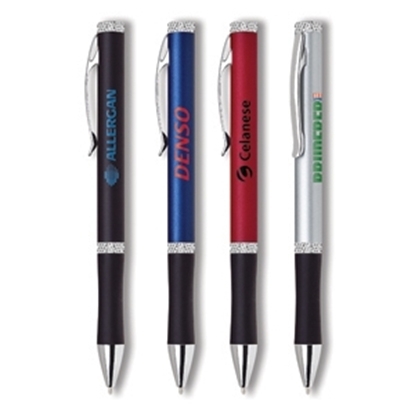 This pen has a 1 color imprint to display the logo or slogan. 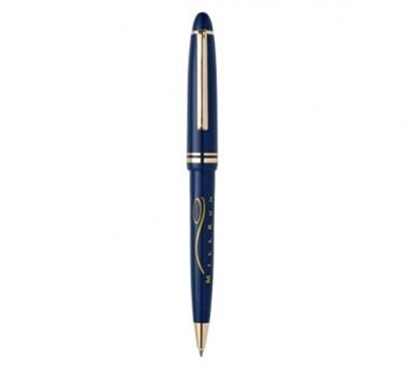 The Stratford has a click style mechanism that protects the ballpoint when not in use. The black medium point refill will last longer then most pen refills. 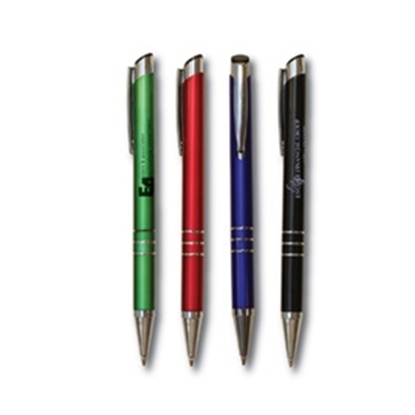 The chrome accented findings and metal clip provide this inexpensive pen with a much higher perceived value. 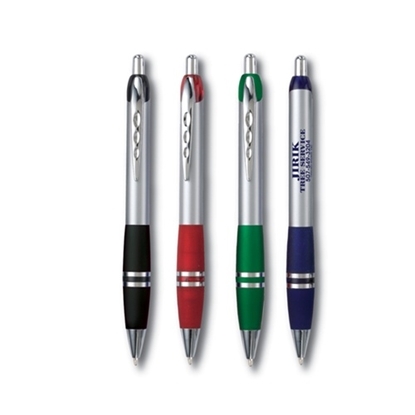 The Stratford is the pen of choice for college recruitment, job fairs, and financial institutions. 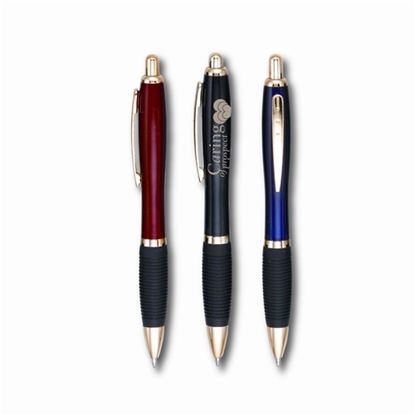 Classically designed twist retractable promotional pens with a beautiful matte finish and gold plated accents. Transform the way you view stylus pen combos! 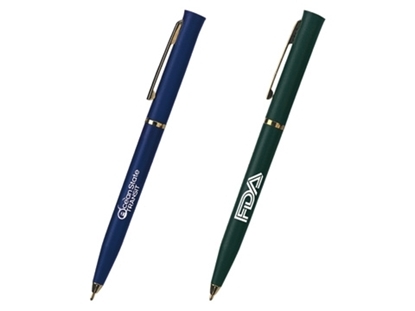 The affordable TRANSFORMER is a click pen and stylus in one. 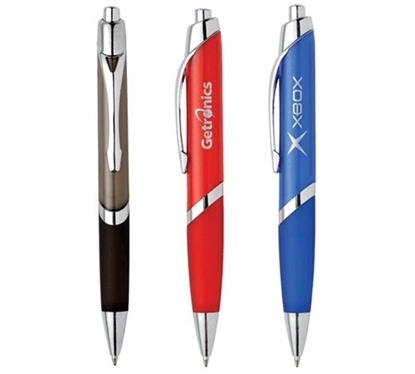 The TRANSFORMER hides the pen inside the stylus until you "click" it free. 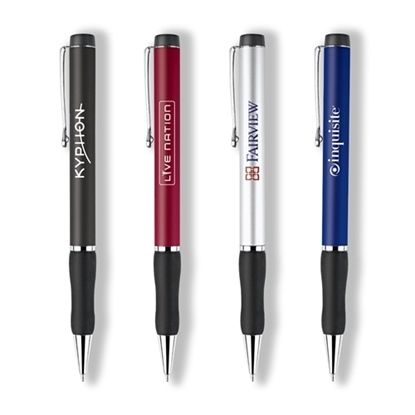 The stylus is compatible with all capacitive touch screen devices such as GPS, tablets, and smartphones. With a comfortable grip, great writing ink, and long lasting stylus, the TRANSFORMER may be the last pen stylus combo you will need. 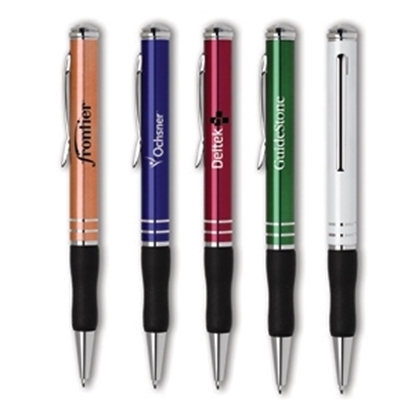 The Euro, with its European look is a great way to show your message to the discerning customer. Prints great in silver on all colors. Multi-color imprint available, call or chat for pricing. Transparent barrels. Oval shaped with triangular shaped clip. Retractable mechanism. Medium point black refill. Silver barrels. Oval shaped barrel with triangular shaped clip. Retractable mechanism. Medium point black refill. 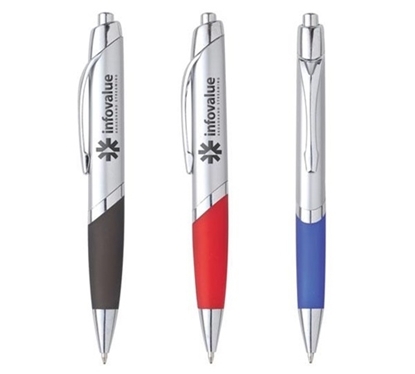 The Euro, with its European look is a great way to show your message to the discerning customer. Prints great in gold on all colors. Multi-color imprint available, please call or chat for pricing. Silver barrel with metal clip. Double metal chrome rings on grip give the Tower an enhanced appeal. Retractable mechanism. Medium point black. Multi-color imprint available, call or chat for pricing. 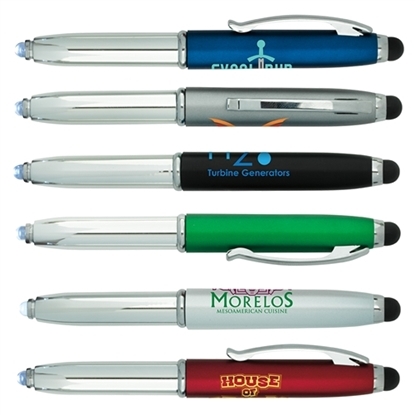 A very classy looking retractable pen, this style, with its chic look is a great way show your customers loyalty and appreciation. Multi-color imprint available, call or chat for pricing. A classy and contoured curvaceous barrel, with a black rubber grip, this hourglass shaped retractable pen is definitely a great value for a modest price. 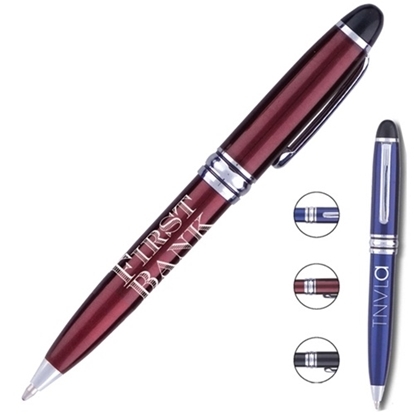 Classic push retractable ballpoint pen. Conservative colors and chrome accents. Recommended imprint colors: silver, white, black on silver. Chic look with multi function options. Pen and stylus combo. Accented barrel gives this a look you will love. 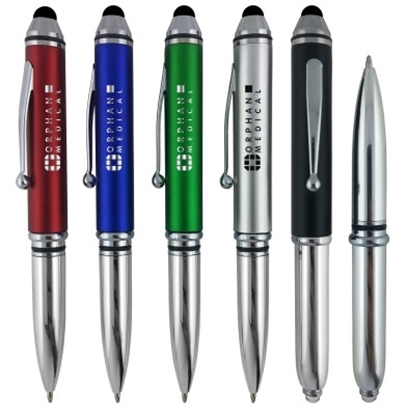 Aluminum twist-action ballpoint with black rubber grip with chrome trims and clip. Plastic LED Stylus Pen. 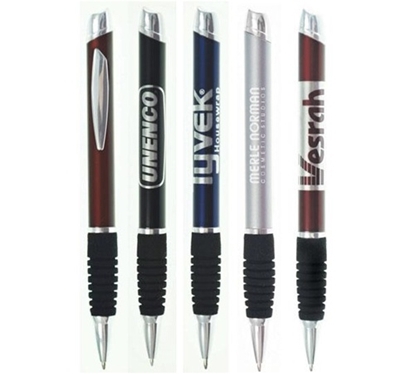 This two-piece ballpoint pen has a built-in soft touch stylus, built-in LED light, metal clip, and uses medium point black ink. Combination pen, flashlight and stylus is perfect for navigating on their tablet, lighting a dark spot or jotting down notes, theyll always be prepared. Plastic barrel available in 5 colors. The Montana, small size and a value as big as all Montana. 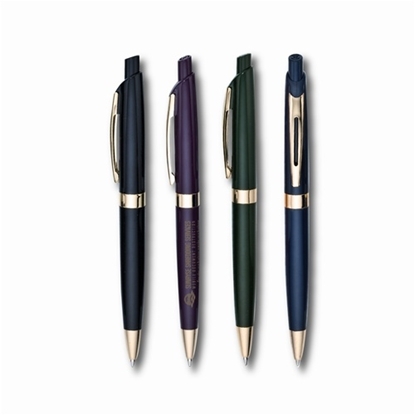 This twist action 1 mm ballpoint metal pens is small enough to fit in your pocket or journal. Say hello to our "little pen". 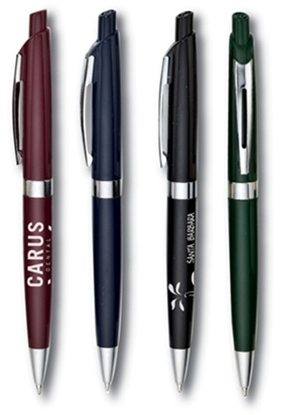 Sophisticated and Functionality in this new pen series. Silver Satin Barrel, chrome trim and black rubber rings grip, give style a new look. 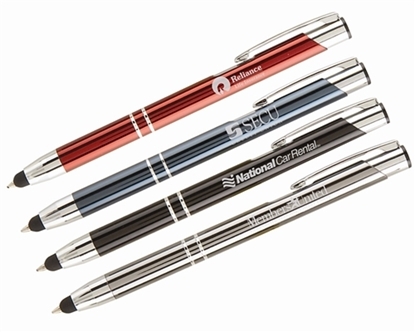 Choose Retractable Ballpoint pen, Gel ink, Roller Ball or Mechanical Pencil. Chose individually or pick your own set. The perfect corporate gift. Click retractable. Brass barrel with soft foam grip. Twist mechanism. 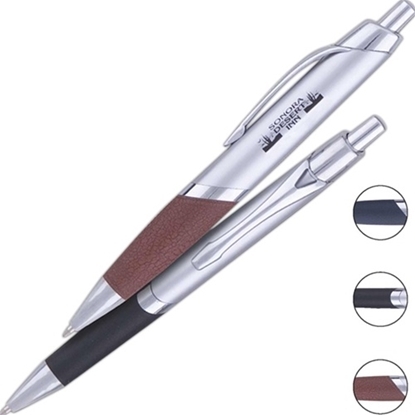 Sleek twist action metal pen with a comfy contoured grip. Available in several shimmering barrel colors. 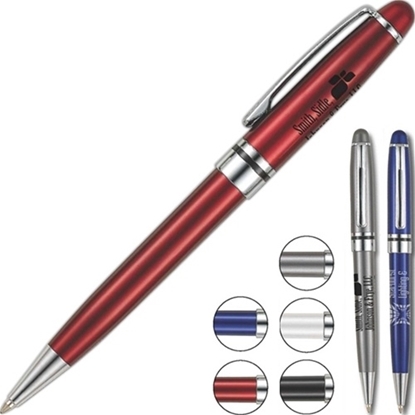 Aluminum constructed ballpoint twist action pen featuring diamond cut middle ring and chrome accents. 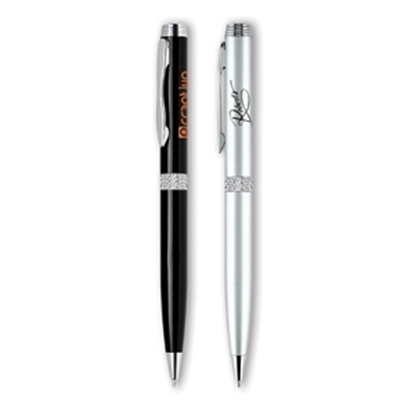 This is one of the top pens that is metal and has a classy look! It has size and weight and feels comfortable in the hand. 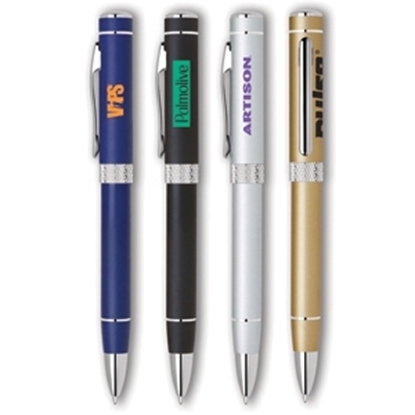 Twist action aluminum pen featuring diamond cut middle ring with chrome clip and accents. Matte finish. 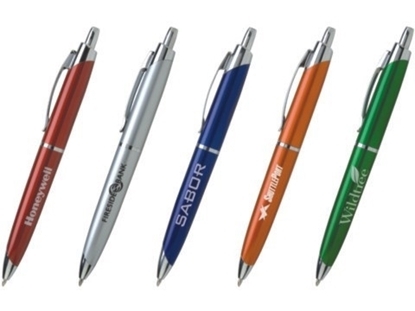 All metal pen with ribbed rubber grip. Retractable mechanism. 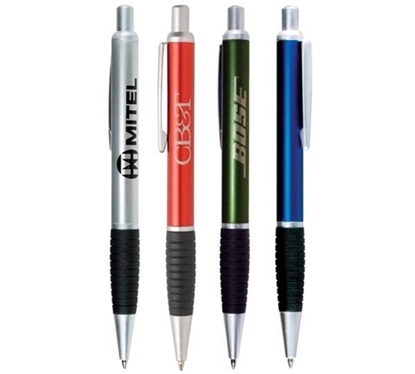 Aluminum twist-action ballpoint with diamond cut middle ring and top in addition to chrome features with a rubber grip providing comfortable writing. 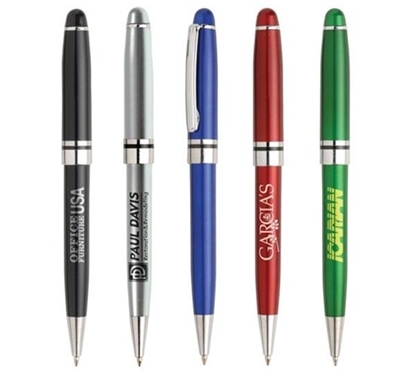 Mypromotionalpens.com offers the largest and best priced selection in Promotional Executive Pens. We will price compete and we won't be under sold. 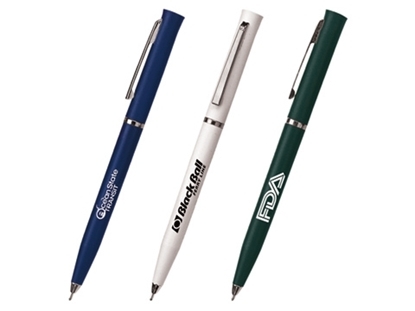 Let our graphic designers make your personalized Executive Pens standout above the crowd at no charge. We won't stop until you are completely satisfied with your custom Executive Pens art proof.Use category search filters on your left to help narrow your search to find exactly what you are looking for.